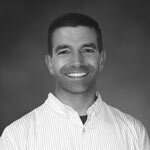 Dr. William McEvoy is a certified hypnotist and has been a chiropractor for over 20 years. In that time he has helped thousands of patients get out of pain, regain their health, return to their hobbies and activities, and to lose weight. He has taken great pride in developing a relaxed and comfortable office where patients are treated as he would like his own family treated. He has offered nutritional consulting and exercise instruction on a one-to-one basis for many years. Utilizing hypnosis and instructing clients with a healthy eating lifestyle has been a natural evolution of his practice of natural, holistic health care. On a personal note, Dr. McEvoy is married and has 2 beautiful daughters. They make their home in Southington with their happy little Pug that keeps them entertained every day. Outside the office he has enjoyed reliving childhood dreams by playing in a men’s baseball league, as well as weight training and exercise, golf, and continually learning about natural health, nutrition, and wellness.